is available exclusively from the American Association of Amateur Astronomers. This is a good idea. When I did the H-400, I got a 3 ring binder with plastic sheet covers for AL forms which cost much more than $15 not counting time and effort. The Herschel 400 Club is meant to be an advanced project for amateur astronomers who already have a fair degree of deep-sky experience. Anyone just starting out should first complete the Astronomical League’s Messier Club before beginning this project. Description: The Astronomer's Herschel 400 Journal is an 8.5x11 inch soft cover, spiral-bound book with many attractive features. 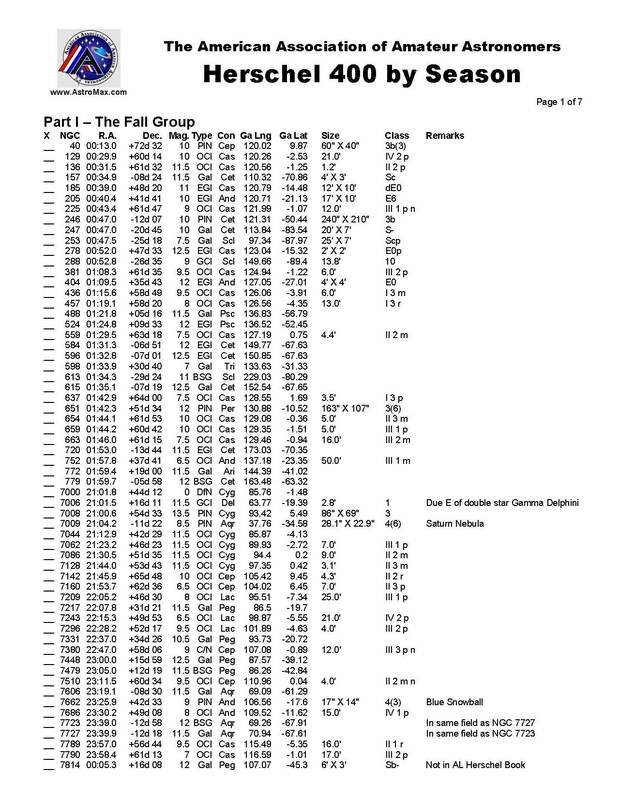 The Herschel 400 Journal consists of 40 log pages containing 10 of the objects on the Herschel 400 List on each page. The Herschel objects are listed in order by NGC number. 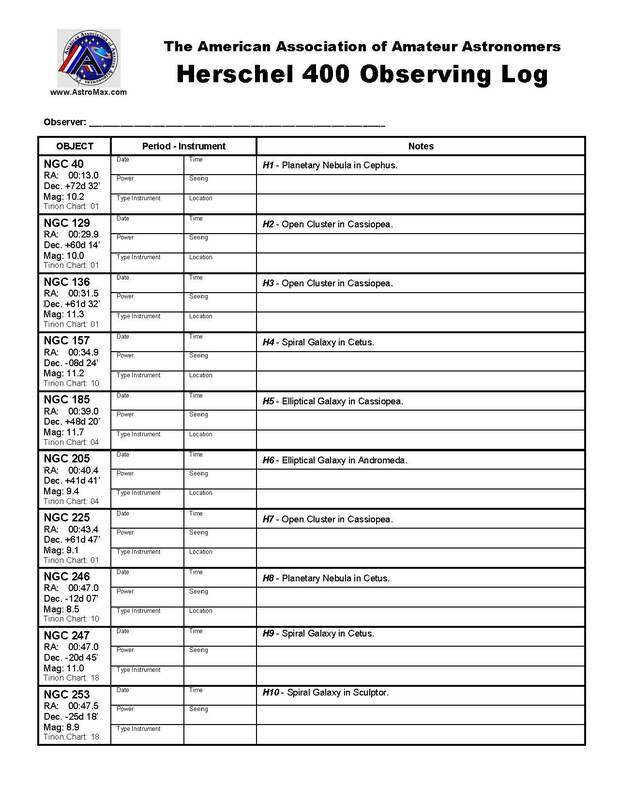 Each listing is already filled in with the essential information on each of the 400 Herschel objects listed in the Astronomical League’s Herschel 400 Club. This information includes NGC Number, Right Ascension and Declination, Visual Magnitude, the Type of Object, and the Constellation in which it can be located. Right Ascension and Declination have been updated to Epoch 2000. There is plenty of space in each entry to be filled in by the user with a brief description of the object when it is observed. Each page is printed on heavyweight paper to minimize “see through” characteristics, contains defined fields of entry, and provides generous space for the observer's notes and additional information on the object. 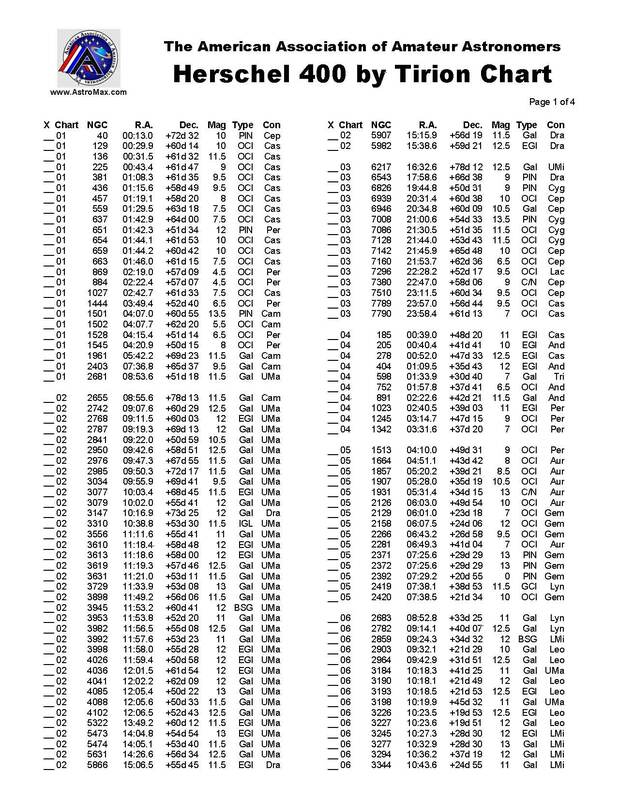 In addition to the log pages, we have provided three versions of the Herschel 400 list: 1) by Season, 2) by Constellation, and 3) by Tirion Sky Atlas 2000 chart number. 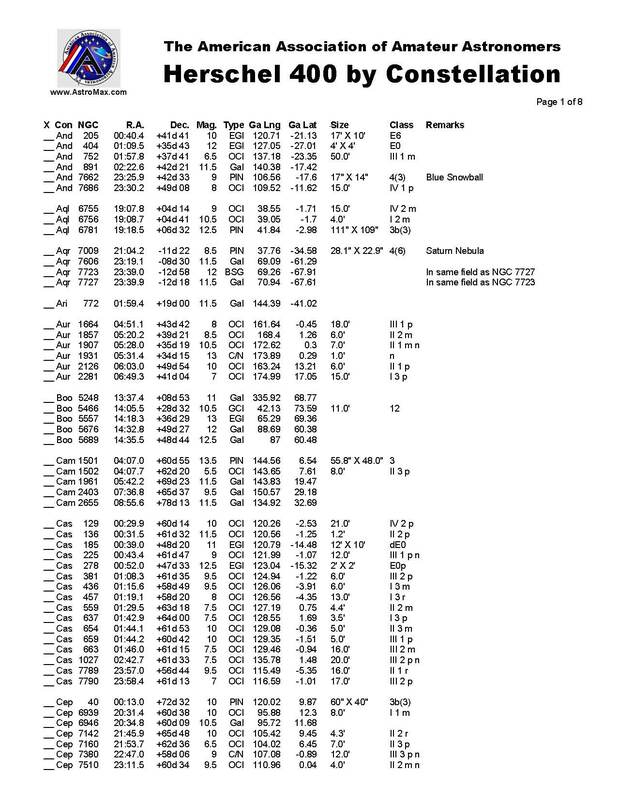 In this edition, we have also included Seeing and Transparency tables to help you as you make your observations. There is also a section on Astronomical Note Taking to help you make better observations. 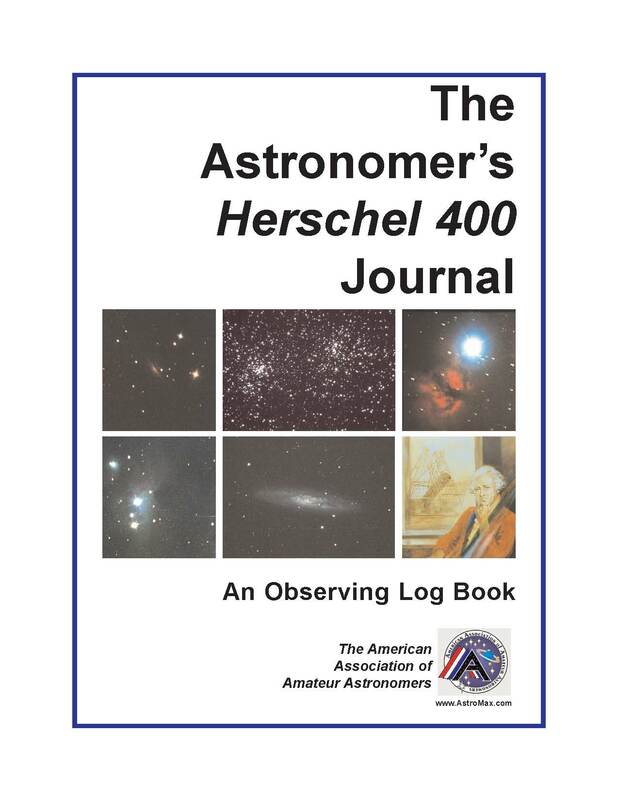 This book will provide you with an easy way to log your Herschel 400 observations, and will make it easy for you to keep track of your progress as you work through the program. 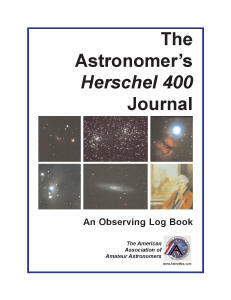 The Astronomer's Herschel 400 Journal is a book that any amateur astronomer pursuing Herschel 400 Club Certification will benefit from. We all know the virtues of writing down what you see and keeping accurate records. The Astronomer's Herschel 400 Journal makes it that much easier to successfully complete the Herschel 400 Club in an organized and economical way. Clear skies! Good Observing! Fight light pollution!